Char-El - "Heaven And Earth"
The latest from electronic musician Char-El (aka Charles Thaxton) is a 2-CD set, each representing a slightly different side of the Char-El experience. Disc 1 (Heaven) consists of all electronic space and New Age explorations, some of which feature Thaxton teamed up with fellow keyboard maestro Gary White. Disc 2 (Earth) includes guests on percussion and guitars which takes the music into more symphonic progressive rock territory. I liked Char-El's debut disc Worlds Without End (reviewed in AI #7), but Heaven And Earth is a huge step forward in this listener's opinion. Until now I found Spacecraft to be the leader in creating New Age space journeys that have musical substance as opposed to the generic qualities that the New Age label implies. 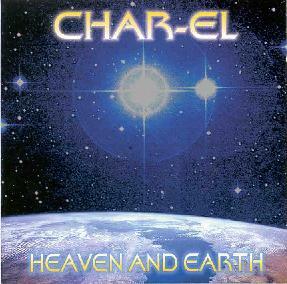 With Heaven And Earth, Char-El too has produced a work that focuses on symphonic majesty but also manages to challenge the listener. My favorite tracks from the Heaven disc were the ones in which Thaxton and White combine their efforts. "Timestream" is an example of which the sound of the two combined is much fuller and includes more varied and competing melody lines and sounds. Sweeping waves of cosmic sound rush alongside heart thumping drones and repetitive minimalist lines. You don't have to listen too closely to realize that there's a lot of activity here. "Higher Realms" is another standout where a repeating pattern is enveloped by a slowly developing motif. Kind of like some of the more purely electronic early Ash Ra Tempel. The title track, "Heaven", is just that... a simple tune but some of the most majestic symphonic electronic music I've heard in a while. Grand soaring waves of keyboards and shooting star synth lines make this an uplifting journey into the... well, the Heavens. My wife is standing over my shoulder listening and says it sounds like Close Encounters when the mothership was hovering overhead. Disc 2 features lots of percussion and several tracks with guitar. The closest comparison I can think of to Larry Clark's guitar combined with Thaxton's keyboards is Michigan progressive artist Jeremy. Tracks like "Full Circle", "Destiny", and "Breaking Free" have classic Hackett style guitar licks, with "Destiny" including some real screamers. "Molecular Dance" has a more rockin' feel and tribal percussion. I thought for sure I'd like disc 2 better given that I typically like more instrumentation, but overall it was the keyboard adventures on disc 1 that grabbed me the most. Still, it's nice hearing Thaxton's assorted interests from space to classic symphonic progressive rock. Available through Backroads Music, 418 Tamal Plaza, Corte Madera, CA 94925.